PAYDAY 2 VR will allow players to cross-play with their friends on a standard desktop PC. With more than 5.5 million community members on the main PC digital distribution platform Steam, PAYDAY 2 have had more than 170 paid and free updates since its release in 2013. 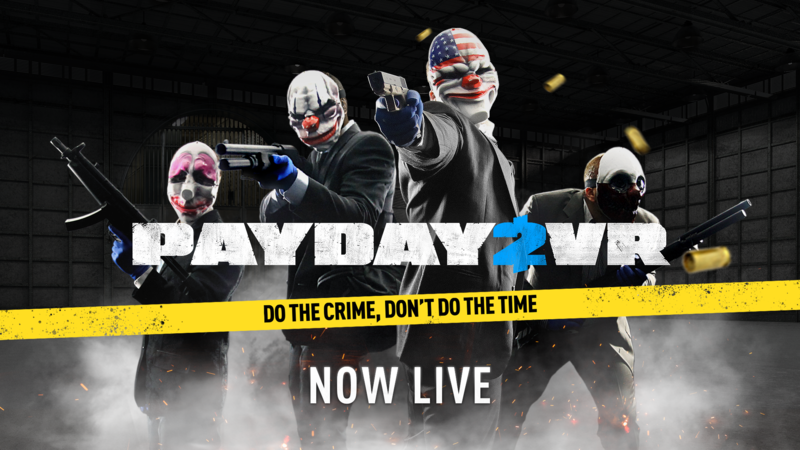 First launched in 2011, PAYDAY is a cooperative first-person shooter computer and video game franchise with more than 16 million units sold on PC, SteamOS, PlayStation™ 3, Xbox 360, PlayStation™ 4, Xbox One and the Nintendo™ Switch system. PAYDAY 2 in VR is now also available for existing owners of PAYDAY 2 on Steam for the HTC Vive and the Oculus Rift headsets. Starbreeze is an independent creator, publisher and distributor of high quality entertainment products. With studios in Stockholm, Paris, Los Angeles, Barcelona and Brussels, the company creates games and other virtual reality entertainment products, based on proprietary design and licensed content. Starbreeze most recent games include PAYDAY 2®, John Wick VR shooter and upcoming survival co-op FPS OVERKILL’s The Walking Dead. Under its publishing initiative, Starbreeze has together with Canadian studio Behaviour Digital successfully launched horror thriller Dead by Daylight.